Bladeless tower fans may look like modern art statues, but they serve a greater function when it comes to air movement. Bladeless Tower fans are more efficient than your typical oscillating fan: cooling a room down quicker thanks to greater air coverage. Here is what you need to know about how bladeless fans work. While looks may be deceiving, a tower fan is a type of oscillating fan, even if it is not classified as such. For the purpose of this description, we will differentiate a tower fan from the standard bladed fan that you think of when you think of a room fan. Traditional fans work by drawing air through them, using the force of the blades. It pulls the air from behind and pushes it forward in a way that it creates a draft: cooling down the air in its proximity. These fans are not good at providing great temperature reduction in a large room; they are more efficient at cooling off those who are sitting near them. Bladeless fans allow for greater coverage of air distribution. 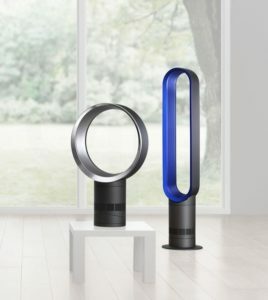 They pull air in through side vents, using internal blades that you cannot see, and spin the air around before pushing it out through the front of the fan. Bladeless fans provide cooler air, as the vertical vents cover a greater area. 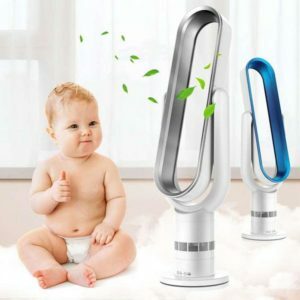 With an oscillating tower fan, you can get 90 degrees of air movement, which is more efficient and effective than a traditional oscillating fan. Bladeless fans tend to come with added features that you don’t get with an oscillating fan. Many have air filters, which allow the fan to double as an air purifier and a fan. By having filters, the fan cleans the air that it pulls in and blows out the cleaned air. This is a great benefit for those who suffer from seasonal allergies. No allergic reaction? That’s a thumbs-up from Baby Bobby. 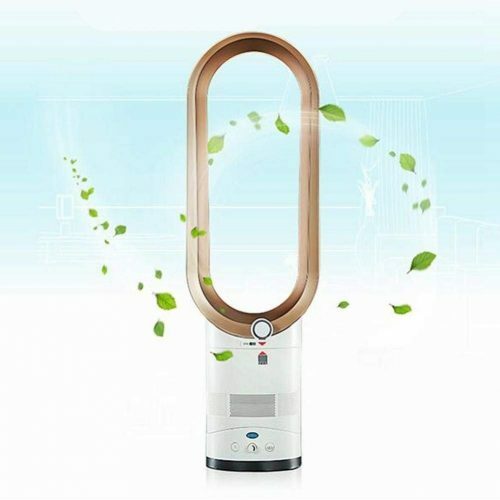 Tower fans also can come with ionizers, which help to “rebalance” the air. Ionizers are sold on the premise that they infuse the air they are blowing with positive ions. In other words, the ionizer electrically charges the air molecules and helps to remove microscopic allergens from the air. Most tower fans have an ionizer on/off switch so that you can control the ionization function. Sometimes the best way to learn is hear from the creator himself. Now as the owner of a massive company it’s fairly unlikely Sir Dyson is the actual inventor – but he sure is good at explaining how these fans work! Some tower fans are now coming with remotes so you can turn the fan on without having to get off the couch. Additionally, there are tower fans that have heater functions as well as humidifier capabilities. The heater fans heat up the air that is pulled in, before it pushes the air out. This is helpful for warming up a room quickly. Having a dual heater and cooling fan is a nice asset, although they are pricier than a standard tower fan. Humidifier tower fans have a small tank of water, that you need to refill regularly. It draws moisture into the air that the fan pulls in before it pushes it back out. These are ideal if you have very dry air, such is in the winter time when there are other heat sources running. You can check out several kinds of tower fans here. Tower fans do need to be cleaned a couple of times a year. You will want to wipe off any dust that has been drawn into the air intake and be sure that the air vents are clean, as well. Fans with filters will need to have the filters cleaned or replaced every month or so, depending on use. If you have a humidifier, you will want to properly clean the holding tank as well. These instructions are usually in the user manual. Most recommend cleaning with white vinegar or a drop of bleach. Tower fans are great for just about any room. Depending on the type you get, you can warm up, cool down, humidify, and clean the air with one, energy efficient fan. Now you can see why these fans are so popular.